Am I an atheist, or not? It depends on the definition of “atheist”, and on the mindset of the person asking. In Europe I label myself agnostic, because I have no understanding of why there is a Universe. But in the United States it’s easiest to say I’m an atheist, because anything short of that implies support for the idea of a personal God. I find offensive the idea of a personal God who, swayed by the emotional appeal of prayers from the devout, favors one person over another. I don’t care whether they’re praying about healing an illness, or winning a ballgame, or picking the right lottery ticket – what morality is there in an omnipotent deity who would intervene in that, and not intervene in the most extreme situations of human suffering? I find illogical the idea of a God who creates individuals and then punishes them for acting according to the nature they were given. I find simplistic the idea that God’s Universe is focused on Earth (let alone on one particular tribe, or sect, or individual), when the Earth is only a small planet of a small star, and there could be more stars in the Universe than there are grains of sand on all the beaches of the whole world. So I’m certain that the personal God of the average American believer doesn’t exist, and couldn’t possibly exist. Today’s post is just a graphic. I’ll be happy to edit this post to give credit, when I know who created this beauty! 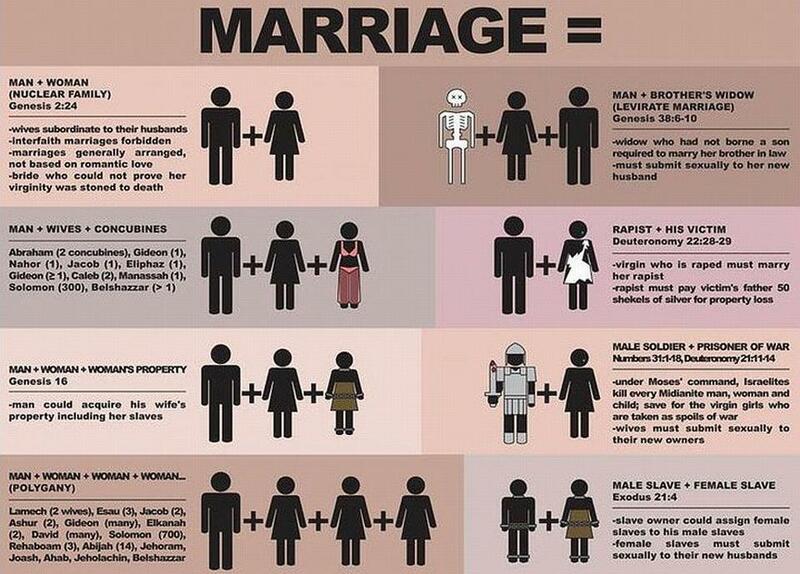 Is everyone really sure they want the Bible defining marriage? Nobody (almost nobody) likes Adolf Hitler. Christians say he was an atheist, atheists say he was a Christian, Jews say he was a mass murderer. But we can get at his beliefs in two ways: through his actions, and through his words. First, he was a human. As a species humans are territorial and resource-possessive. We’ve been walking out of Africa in waves for the past 100,000 years, staking a claim to the empty places we like, pushing out the inhabitants of a previous wave, defending our turf against the next wave. We use our gods as moral justification for murder, and we glorify our massacres as historic victories. The Jews took over the Promised Land of Canaan in this way, with Moses telling them that God said to kill every man, woman, child, animal and tree in the targeted cities in order “that they not pollute you with their evil ways” (Deuteronomy 20: 16-18). 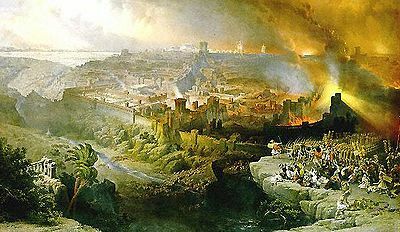 With these cities the soldiers weren’t even allowed to abduct the virgins, they had to kill everything. And so the Jews wiped out the people there and took Palestine for themselves. Christians, Jews and atheists… who claims that this was good? Hitler’s actions were no worse than Moses’ or Joshua’s, and for the same reason. 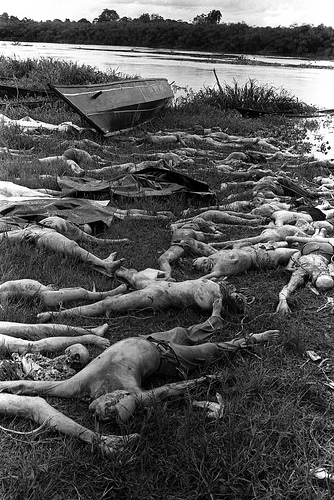 Genocide for the sake of ethnically uncontested control of territory and resources, and for racial purity. No way, Christian! Jesus didn’t intend any changes to the Mosaic Law: “Think not that I am come to destroy the law, or the prophets: I am not come to destroy, but to fulfill. For verily I say unto you, Till heaven and earth pass, one jot or one tittle shall in no wise pass from the law, till all be fulfilled.” (Matthew 5: 17-18) Any subsequent changes are the work of Paul, not Jesus. In sum, Hitler was one of those Christians who wants his Christianity free of Jews. And if his actions were evil, so too were those of Moses, Joshua and God. So don’t blame atheism for Hitler and the Holocaust. 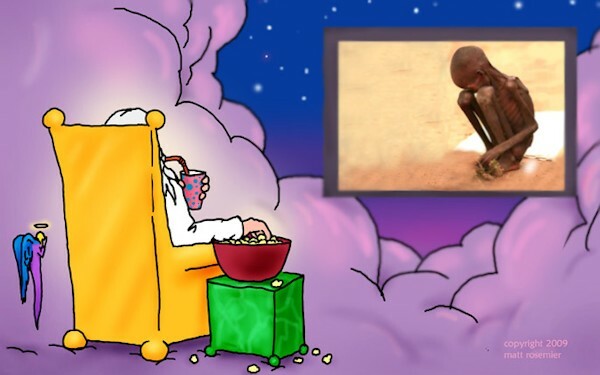 Blame Moses and God… or blame the species we call “humanity”. What can a God possibly want? It appears the Yahweh of the Old Testament wants to have people worship Him. Obey Him. Sacrifice things to Him. In order to achieve this, He created a Covenant with Abraham that He would favor Abraham’s descendants, so long as they did everything He demanded. He had apparently already created a system that guaranteed eternal punishment for those who failed to follow Him, as incentive for obeying Him. And He created a system that, by the time of the New Testament, allows for a total of 144,000 people to go to Heaven, and the other 100 billion or whatever to go to Hell for eternity. 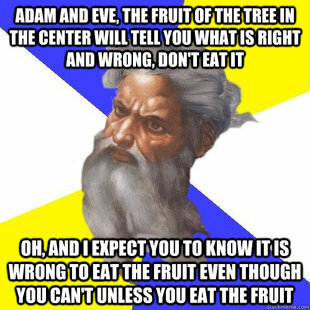 Followers of this God say it has nothing to do with Predestination. He gives everyone freedom of choice, to follow Him or not. The only problem is, He created the whole system that in His omnipotence He could have made any way He wanted, and in His omniscience He knew damn well that tens of billions would go to Hell for eternity. Not only that, He triggered it by setting a trap for Adam and Eve, and then punishing all their descendants forever for falling into the trap. Is this loving? No. Is it even rational? No. It is beyond cruel, it is insane. If there is a God of the Old Testament, He is merely a manifestation of the Chaos of the Universe, and is without direction or morality. As for believers in the God, are they rational? How can they call this God by such names as “the beneficent”, “the all-loving”, “the merciful”? How can they love Him? How can they respect Him as a God who looks after and cares for all His creatures, when thousands of children die every day from starvation and preventable diseases? Grow up, believers! Outgrow your prayers and worship of the irrational Old Gods of Chaos, and turn to the joyful task of discovering the Universe and improving human existence.